Footsteps from Buckingham Palace and St James’ Park, in the heart of central London, lies a discreet, Victorian masterpiece: St James’ Court, A Taj Hotel. The hotel debuted in 1902 and to this day, retains the sophistication and charm of its past – but now entwines this with a contemporary finish. Continuing with its commitment to reinvent tradition, St James’ Court has recently been undergoing a multi-million pound refurbishment. 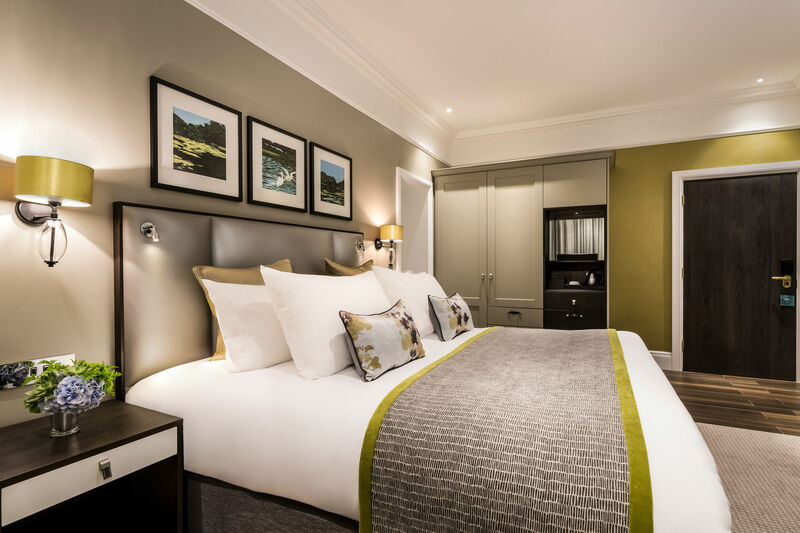 In June 2018, as part of the refurbishment, the hotel officially launched its newly renovated rooms at the Almoners Townhouse. The rooms were designed by award-winning studio Dexter Moren Associates, in collaboration with interior design consultant, Sue Freeman. Responsible for the entirety of the project, Dexter Moren Associates worked to maintain the balance between the hotel’s historic design features and fresh, modern finishes. The design team was also tasked with ensuring the renovation complemented the hotel’s on-going “English Classics, Reinvented” series; a partnership between Taj and contemporary British artists that gives literary classics a new lease of life, with a selection of limited edition covers. 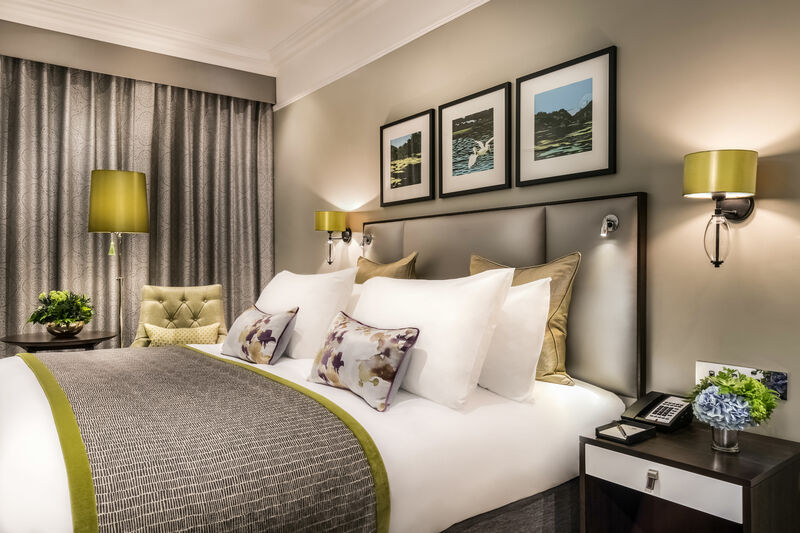 Dexter Moren Associates designed a selection of the hotel’s premium rooms, blending the influence of modern-day London with the historical roots of St James’ Court – which, after over 100 years, is still considered one of Britain’s finest luxury hotels. As part of the brief, the designers also needed ensure that each of the rooms was comfortable and convenient, acting as a welcoming retreat for guests. Located in the Almoners Townhouse, the renovated premium rooms took nine months to refurbish, with Dexter Moren Associates reconfiguring the internal floor plan to make each of the rooms more spacious and functional. As the lead designers, the studio was also responsible for redesigning circulation areas – including a new 13 passenger lift – and upgrading the acoustic installation of St James’ Courts’ traditional timber windows. The renovated areas now exquisitely blend heritage with contemporary design, evocative of a modern townhouse without forgetting the building’s historic features. 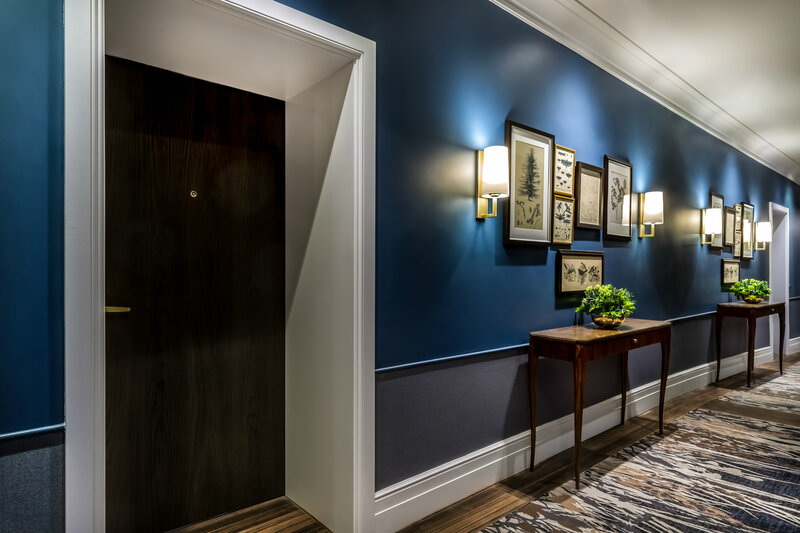 In the hallway, cleverly crafted light installations from Heathfield & Co work with a deep blue colour palette to create a sophisticated look, which is accentuated by the clusters of nature-inspired artworks from Project Art. The natural theme continues into the renovated rooms, where a variety of earthy colour palettes draw inspiration from the surrounding cityscape – including St James’ Park. Within each room, Dexter Moren Associates has signified the different uses of the space by adding two types of flooring; the ‘bedroom’ space features lush, neutral carpets from Ulster Carpets, while the mini-bar kitchen space features dark wooden flooring. Each spacious room has simple panelling and elegant touches, including bespoke decorative maps that are suspended throughout. Pale hues were used throughout the colour scheme to accentuate the abundance of natural light, giving the newly renovated spaces a bright and airy feel. Each of the rooms also features a luxuriously modern bathroom, designed with a neutral palette that continues the open, bright feel. 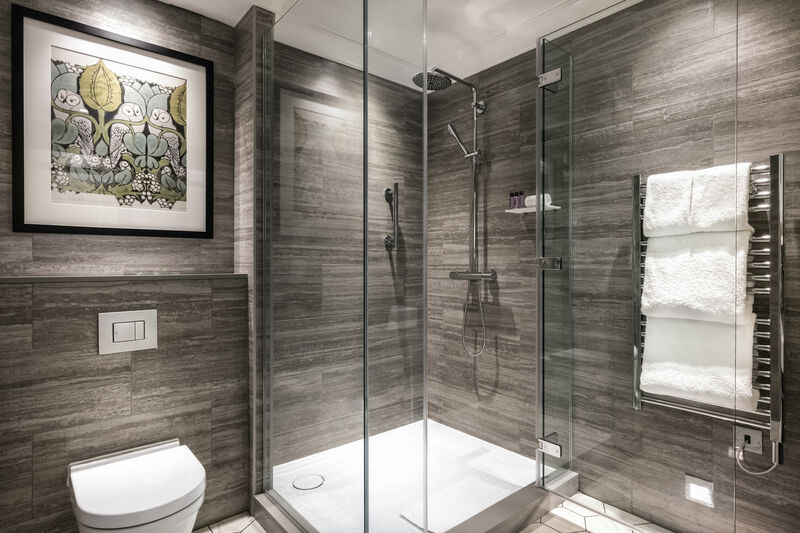 Within the bathrooms, Dexter Moren has included large rain showers and clever lighting fixtures, using suppliers including Grohe, Duravit and Kaldewei. As well as the newly renovated premium rooms, St James’ Court’s on-going refurbishment also saw the opening of new spa facilities in August 2018; within the spa, guests can indulge in a plunge pool, pampering treatments and soothing massages. With updated spa facilities and the new Dexter Moren Associate designed rooms, St James’ Court, A Taj Hotel, marries comfort with elegance, and sophistication with heritage - guaranteeing guests are offered a unique and welcoming experience in the heart of central London.